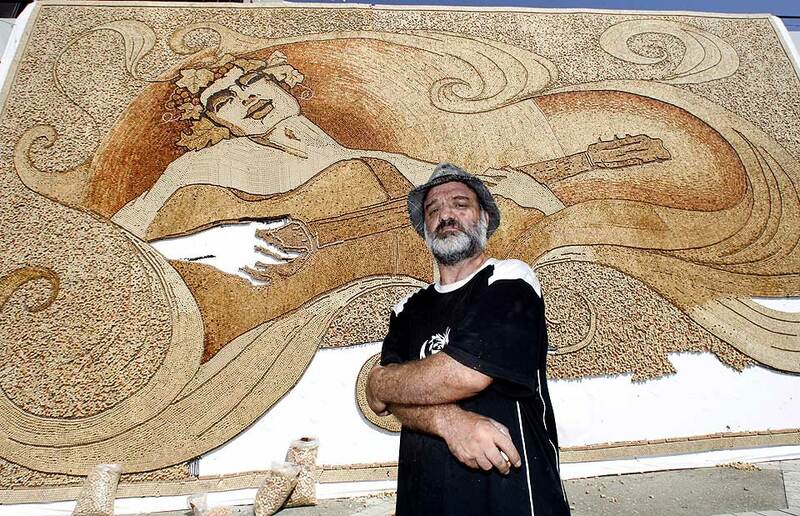 Saimir Strati is an Albanian artist who is primarily known as one of the world’s most famous mosaic artists. Born in Tirana, Albania on April 11, 1966, Strati began his career restoring numerous mosaics in the Albanian archeological sites of Amantia, Appolonia and Byllis. Throughout his life, he’s used a wide variety of materials to build his mosaics, some more traditional than others. They include mirror glass, porcelain, eggshells, corks, toothpicks, coffee beans, sea glass, nails and even compact discs! 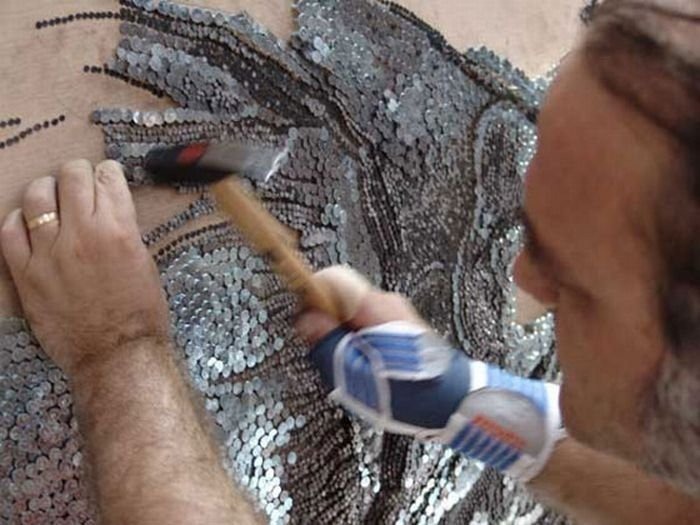 In 2006, Strati created the largest nail mosaic in the world. The artist reproduced a Leonardo Da Vinci self-portrait using around 400 Kg of nails over a 2X4m surface. A year later, Strati unveiled the world’s largest toothpick mosaic. The artist used around 1.5 million toothpicks, working during 40 days to create his 8 square meter mosaic of a horse. Dedicated to Spanish architect Antoni Gaudi, this piece of art was displayed at the Arbnori International Centre of Culture in Tirani. In 2008, the artist created yet another piece of mosaic art, this time using 229,764 corks to construct a Mediterranean-themed mosaic. This was followed by the world’s largest paintbrush mosaic in 2009 (again recognized by Guinness) depicting Michael Jackson, as a homage to the recently deceased King of Pop. 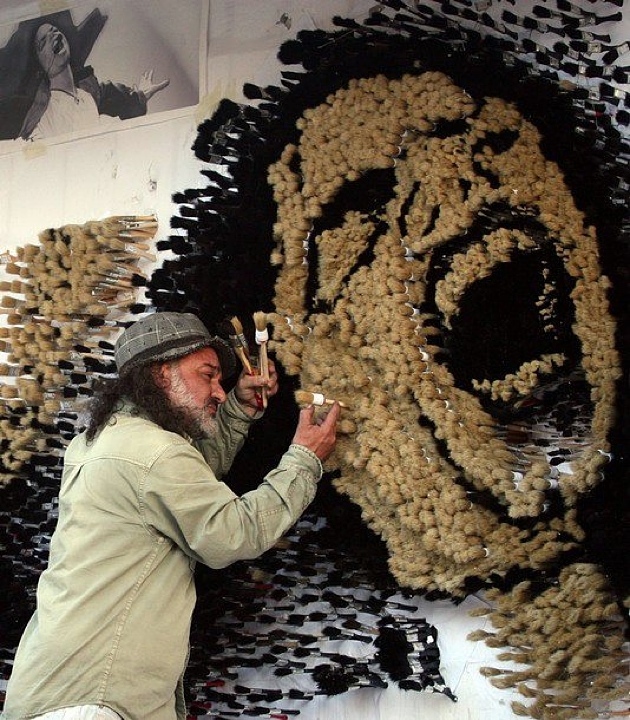 Strati used around 230,000 paintbrushes and earned his fourth Guinness world record. 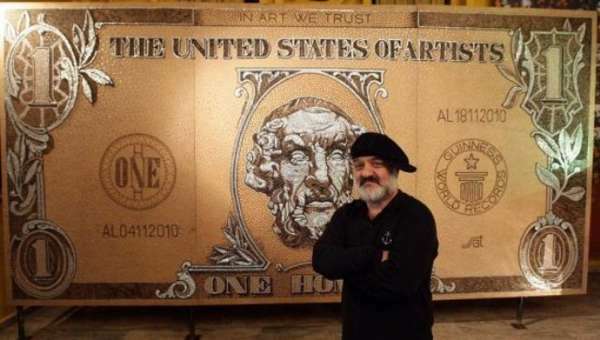 In 2010, the Albanian finished a lovely piece of work displaying a bank note. Dedicated to all the artists in the world, it portrayed a blind Homer on a US dollar bill. It read “The United States of Artists” and “One Homer”. The mosaic was meant to show that despite most artists being poor, they are blind to money. What drives them is their art and not financial gain. All in all, Strati has already set six back-to-back Guinness World Records and is also a member of the British Association of Modern Mosaic. As time passes, there is no doubt that this trendsetter in mosaic art will continue to dazzle us with his work and set new records.